I’ve never been able to pull off a properly crispy hash brown. This has been something that has bothered me for some time…sitting in the back of my mind taunting me. I like a good challenge, plus there’s always google, right? 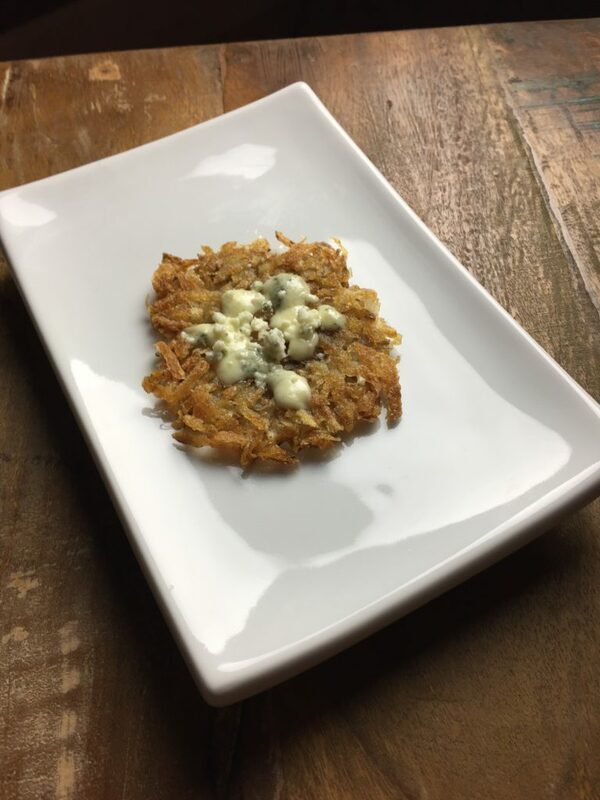 So, I decided to create an unconventional hash brown that is super easy, super interesting, and super tasty! I served them as the starch base for some pan-seared venison steaks. More on that later…here you go, try it. I dare you! Grate on a grater or food processor and put in a medium bowl. Rinse and drain the grated potato 3 times. Pat the potatoes dry and lay out on paper towels and let sit. Add the potato slowly, in a pile and press it down to form a patty about 3 inches across. Keep an eye on the underside by carefully lifting to see if the potato is browning. When it’s golden brown, carefully flip the hash brown. Carefully sprinkle the crumbled gorgonzola on the browned side while the uncooked side is browning. When the second side is golden brown, remove the hash brown. Eat as is, or serve with grilled meat or fried eggs.